"Wicked" problems are large-scale, long-term policy dilemmas in which multiple and compounding risks and uncertainties combine with sharply divergent public values to generate contentious political stalemates; wicked problems in the environmental arena typically emerge from entrenched conflicts over natural resource management and over the prioritization of economic and conservation goals more generally. Most important, the book reviews current thinking on the way forward, focusing on the implementation of "learning networks," in which public managers, technical experts, and public stakeholders collaborate in decision-making processes that are analytic, iterative, and deliberative. Case studies of forest management in the Sierra Nevada, restoration of the Florida Everglades, carbon trading in the European Union, and management of the Ngorongoro Conservation Area in Tanzania are used to explain concepts and demonstrate practical applications. 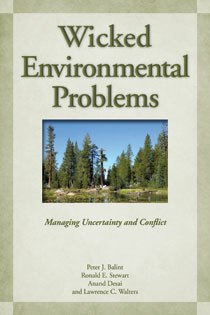 Wicked Environmental Problems offers new approaches for managing environmental conflicts and shows how managers could apply these approaches within common, real-world statutory decision-making frameworks. It is essential reading for anyone concerned with managing environmental problems. "This book should be required reading for government resource managers, their supervisors, and NGOs concerned with resource issues. Wicked problems, characterized by a high degree of scientific uncertainty and deep disagreement on values, will inevitably proliferate with increasing population and pressures on our lands and resources. This important book describes approaches to deal with wicked problems, and equally important, how not to approach them." "Natural resource issues are becoming increasingly complex and difficult to resolve. In this book, Peter Balint and his colleagues offer fascinating insights into so-called wicked environmental problems. They suggest a commonsense approach to engage stakeholders through an adaptivemanagement framework for assessing policy options and devising solutions for the real world." "Wicked Environmental Problems is a thoughtful response to the question faced by every forest manager and land planner: how do we address risk and uncertainty in the face of profound public disagreement over management options for public lands? I highly recommend this book to anyone interested in complex environmental planning." "Overall, a useful and affordable volume for scholars and practitioners in environmental management, complementing more detailed theoretical books on the market." "Both specialist and general reader will find much to engage them by reading Wicked Environmental Problems." "This book has much to recommend it. The review of the wicked problems literature is very useful, especially for planning theory courses. The case studies nicely illustrate, especially when the outcomes are risky and the science is uncertain. Policy analysts and modelers will find the innovative preference analysis of special interest."